I love water – I really do. Water not only quenches the thirst, but it also helps keep you feeling “full” so that you eat less. And we all know that drinking enough water is important to maintaining a healthy digestive tract and staying “regular”. Water can be boring, though, can’t it? That’s why I really like flavored water, and you may recall that I have posted on flavored water before – Hint Water (love the blueberry flavor). I have also shared with you how to make your own flavored water with just a pitcher of water and fresh fruits or veggies. I have recently found a new water obsession – O Water. 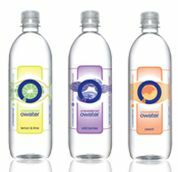 O Water is unsweetened water that has a natural fruit flavor and that is enhanced with electrolytes, making it qualify as a sports drink, minus all the sugar and artificial sweeteners and calories that most sports drinks have. I also love the fact that it is sodium free as I think it is important to watch your salt intake to stave off high blood pressure and other problems. And after all, a high-salt diet can make you retain water weight! Zero Calorie O Water is available in plain, lemon & lime, wild berries, peach, strawberry and mandarin orange. I have tried several flavors of this water, and all of them are satisfying and taste great. One reason that I really like flavored water is that it puts an end to water boredom so that I can stay on track with my water intake and avoid other beverages (and unnecessary calories). And since the body consists of as much as 78% water, getting enough water is invariably important for transporting oxygen and nutrients into our cells, helping with metabolism, regulating body temperature, detoxifying the body and so much more. O Water and other flavored waters can help you to reach your goal of drinking the recommended 64 ounces of water each day – and make it a tastier experience!